Room 3 is unofficially called ‘The Owl Room’ (due to the many owl photos!! ), this luxuriously large king size ensuite bedroom is on the first floor and has a big bay window with stunning views over the town and surrounding countryside. 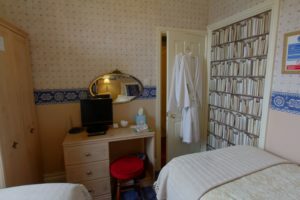 We have now added a twin room, so when this is open it allows The Owl Room to become a twin or family suite. The twin room has two single beds in it. The sun will help to wake you up in the morning. The original features in this room is a traditional tiled fireplace, cornicing, picture rail, bell pushes (thankfully not working, no matter how hard you try!) and high ceilings. There are 2 arm chairs in the bay window to sit and admire the view. The room has a king-size bed with a bathroom ensuite (an electric show is over the bath, and slip mat provided). A maximum of 4 people can sleep in this room. Adults: From £20 in the winter to £60 in the summer per person per night based on two people sharing. Singles: From £35 to £90 per night. View pricing and booking information on our Tariff page. 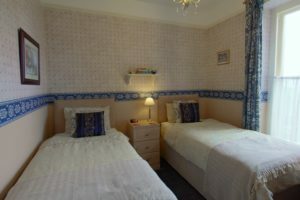 There is a wonderful view of the town and the surrounding countryside with this room. This room is found on the 1st floor so may not be suitable for people with mobility issues. A maximum of 4 people can use this room. There is room for a cot to be used. There is a bath with a shower over it in the ensuite.